Evergood Elixirs makes wine from lemons, not grapes. Skier Pee, Snow Bunny & Switch Stance are true non-carbonated citrus wines, delicious and refreshing over ice. They take 6 weeks to ferment and the ABV is 10%. All are gluten-free, vegan, and low in sugar compared to “sweet” wines. Skier Pee, our “flagship” wine, tastes like adult lemonade. Snow Bunny is our strawberry flavored lemon wine that tastes like adult cool-ade. And Switch Stance, our newest wine, is made from both lemons and limes and tastes like an adult spright or mountain doo. An instant margarita in a bottle! Our wines are low in sugar! Most sweet wines contain 3.5 – 7 grams of sugar per ounce. Skier Pee and Switch Stance contain 1.5 grams and Snow Bunny contains 2.1 grams! 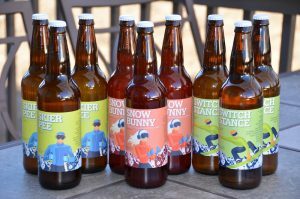 Skier Pee, Snow Bunny, and Switch Stance are completely different from Mike’s hard lemonade and traditional wine coolers, which are made from malted barley and have low ABV. In fact, most wine coolers don’t even contain wine! Our whimsical branding and packaging, unique recipe, and mystique of the Colorado mountains allow us to offer the right product at the right time.